I have often been asked how I came to write. The best answer is that I needed the money. When I started I was 35 and had failed in every enterprise I had ever attempted. 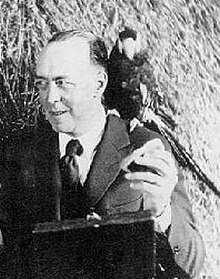 Edgar Rice Burroughs (1 September 1875 – 19 March 1950) was an American author of science-fiction and adventure stories, most famous for the creation of the jungle-born hero Tarzan. Let all respect Tarzan of the Apes and Kala, his mother. There be none among you as mighty as Tarzan. Let his enemies beware. In a cupboard filled with books he came across one with brightly colored pictures — it was a child's illustrated alphabet — A is for Archer Who shoots with a bow. B is for Boy, His first name is Joe. The pictures interested him greatly. In his hands was a primer opened at a picture of a little ape similar to himself, but covered, except for hands and face, with strange, colored fur, for such he thought the jacket and trousers to be. Beneath the picture were three little bugs — BOY. Tarzan of the Apes was no sentimentalist. He knew nothing of the brotherhood of man. All things outside his own tribe were his deadly enemies, with the few exceptions of which Tantor, the elephant, was a marked example. And he realized all this without malice or hatred. To kill was the law of the wild world he knew. Few were his primitive pleasures, but the greatest of these was to hunt and kill, and so he accorded to others the right to cherish the same desires as he, even though he himself might be the object of their hunt. And when he killed for revenge, or in self-defense, he did that also without hysteria, for it was a very businesslike proceeding which admitted of no levity. Ch. 11 : "King of the Apes"
Withdrawing the knife that had so often rendered him master of far mightier muscles than his own, Tarzan of the Apes placed his foot upon the neck of his vanquished enemy, and once again, loud through the forest rang the fierce, wild cry of the conqueror. Now was the quiet, fierce solitude of the primeval forest broken by new, strange cries. No longer was there safety for bird or beast. Man had come. Other animals passed up and down the jungle by day and by night — fierce, cruel beasts — but their weaker neighbors only fled from their immediate vicinity to return again when the danger was past. The duties of kingship among the anthropoids are not many or arduous. … But Tarzan tired of it, as he found that kingship meant the curtailment of his liberty. He longed for the little cabin and the sun-kissed sea — for the cool interior of the well-built house, and for the never-ending wonders of the many books. 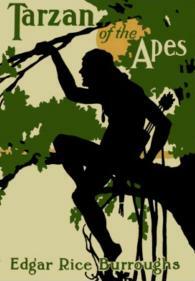 But deep in the minds of the apes was rooted the conviction that Tarzan was a mighty fighter and a strange creature. Strange because he had had it in his power to kill his enemy, but had allowed him to live — unharmed. Tarzan of the Apes had decided to mark his evolution from the lower orders in every possible manner, and nothing seemed to him a more distinguishing badge of manhood than ornaments and clothing. To this end, therefore, he collected the various arm and leg ornaments he had taken from the black warriors who had succumbed to his swift and silent noose, and donned them all after the way he had seen them worn. About his neck hung the golden chain from which depended the diamond encrusted locket of his mother, the Lady Alice. At his back was a quiver of arrows slung from a leathern shoulder belt, another piece of loot from some vanquished black. About his waist was a belt of tiny strips of rawhide fashioned by himself as a support for the home-made scabbard in which hung his father's hunting knife. The long bow which had been Kulonga's hung over his left shoulder. The young Lord Greystoke was indeed a strange and war-like figure, his mass of black hair falling to his shoulders behind and cut with his hunting knife to a rude bang upon his forehead, that it might not fall before his eyes. His straight and perfect figure, muscled as the best of the ancient Roman gladiators must have been muscled, and yet with the soft and sinuous curves of a Greek god, told at a glance the wondrous combination of enormous strength with suppleness and speed. With the noble poise of his handsome head upon those broad shoulders, and the fire of life and intelligence in those fine, clear eyes, he might readily have typified some demigod of a wild and warlike bygone people of his ancient forest. But of these things Tarzan did not think. He was worried because he had not clothing to indicate to all the jungle folks that he was a man and not an ape, and grave doubt often entered his mind as to whether he might not yet become an ape. The conduct of the white strangers it was that caused him the greatest perturbation. He puckered his brows into a frown of deep thought. It was well, thought he, that he had not given way to his first impulse to rush forward and greet these white men as brothers. They were evidently no different from the black men — no more civilized than the apes — no less cruel than Sabor. Tarzan sat in a brown study for a long time after he finished reading the letter. It was filled with so many new and wonderful things that his brain was in a whirl as he attempted to digest them all. So they did not know that he was Tarzan of the Apes. He would tell them. In his tree he had constructed a rude shelter of leaves and boughs, beneath which, protected from the rain, he had placed the few treasures brought from the cabin. Among these were some pencils. She has never harmed us, nor would she should we have fallen into her hands. It is only the men of her kind who war upon us, and I have ever thought that their attitude toward us is but the reflection of ours toward them. They live at peace with all their fellows, except when duty calls upon them to make war, while we are at peace with none; forever warring among our own kind as well as upon the red men, and even in our own communities the individuals fight amongst themselves. Oh, it is one continual, awful period of bloodshed from the time we break the shell until we gladly embrace the bosom of the river of mystery, the dark and ancient Iss which carries us to an unknown, but at least no more frightful and terrible existence! Fortunate indeed is he who meets his end in an early death. Say what you please to Tars Tarkas, he can mete out no worse fate to me than a continuation of the horrible existence we are forced to lead in this life. All quotes are from the public domain text of the novel, available at "The Land that Time Forgot"
But metaphor, however poetic, never slaked a dry throat. “There is no reason why we should carry our racial and political hatreds into Caprona,” I insisted. “The Germans among us might kill all the English, or the English might kill the last German, without affecting in the slightest degree either the outcome of even the smallest skirmish upon the western front or the opinion of a single individual in any belligerent or neutral country. I therefore put the issue squarely to you all; shall we bury our animosities and work together with and for one another while we remain upon Caprona, or must we continue thus divided and but half armed, possibly until death has claimed the last of us? Like all his kind and all other bullies, von Schoenvorts was a coward at heart. Miss La Rue was very quiet, though she replied graciously enough to whatever I had to say that required reply. I asked her if she did not feel well. “Yes,” she said, “but I am depressed by the awfulness of it all. I feel of so little consequence—so small and helpless in the face of all these myriad manifestations of life stripped to the bone of its savagery and brutality. I realize as never before how cheap and valueless a thing is life. Life seems a joke, a cruel, grim joke. You are a laughable incident or a terrifying one as you happen to be less powerful or more powerful than some other form of life which crosses your path; but as a rule you are of no moment whatsoever to anything but yourself. You are a comic little figure, hopping from the cradle to the grave. Yes, that is our trouble—we take ourselves too seriously; but Caprona should be a sure cure for that.” She paused and laughed. She was a dear girl and a stanch and true comrade—more like a man than a woman. I was sure that Lys was dead. I wanted myself to die, and yet I clung to life—useless and hopeless and harrowing a thing as it had become. I clung to life because some ancient, reptilian forbear had clung to life and transmitted to me through the ages the most powerful motive that guided his minute brain—the motive of self-preservation. I was armed only with a hunting knife, and this I whipped from its scabbard as Kho leaped toward me. He was a mighty beast, mightily muscled, and the urge that has made males fight since the dawn of life on earth filled him with the blood-lust and the thirst to slay; but not one whit less did it fill me with the same primal passions. Two abysmal beasts sprang at each other’s throats that day beneath the shadow of earth’s oldest cliffs—the man of now and the man-thing of the earliest, forgotten then, imbued by the same deathless passion that has come down unchanged through all the epochs, periods and eras of time from the beginning, and which shall continue to the incalculable end—woman, the imperishable Alpha and Omega of life. That night the clouds broke, and the moon shone down upon our little ledge; and there, hand in hand, we turned our faces toward heaven and plighted our troth beneath the eyes of God. No human agency could have married us more sacredly than we are wed. We are man and wife, and we are content. All quotes are from the public domain text of the novel, available at "The People that Time Forgot"
She was quite the most wonderful animal that I have ever looked upon, and what few of her charms her apparel hid, it quite effectively succeeded in accentuating. What was this hold she had upon me? Was I bewitched, that my mind refused to function sanely, and that judgment and reason were dethroned by some mad sentiment which I steadfastly refused to believe was love? I had never been in love. I was not in love now—the very thought was preposterous. I could have kicked myself for the snob and the cad that my thoughts had proven me—me, who had always prided myself that I was neither the one nor the other! All quotes are from the public domain text of the novel, available at "Out of Time's Abyss"
This was a new menace that threatened them, something that they couldn’t explain; and so, naturally, it aroused within them superstitious fear. Past experience suggested that the great wings were a part of some ingenious mechanical device, for the limitations of the human mind, which is always loath to accept aught beyond its own little experience, would not permit him to entertain the idea that the creatures might be naturally winged and at the same time of human origin. Thus Bradley reasoned—thus most of us reason; not by what might be possible; but by what has fallen within the range of our experience. All my life I have been kicked and cuffed by such as that, and yet always have I gone out when they commanded, singing, to give up my life if need be to keep them in power. Only lately have I come to know what a fool I have been. But now I am no longer a fool, and besides, I am avenged. I determined there was a great future in the mail-order business, and I landed a job that brought me to the head of a large department. About this time our daughter Joan was born. Having a good job and every prospect for advancement, I decided to go into business for myself, with harrowing results. I had no capital when I started and less when I got through. At this time the mail-order company offered me an excellent position if I wanted to come back If I had accepted it, I would probably have been fixed for life with a good living salary. Yet the chances are that I would never have written a story, which proves that occasionally it is better to do the wrong thing than the right. When my independent business sank without a trace, I approached as near financial nadir as one may reach. My son, Hulbert, had just been born. I had no job, and no money. I had to pawn Mrs, Burroughs' jewelry and my watch in order to buy food. I loathed poverty, and I should have liked to have put my hands on the man who said that poverty is an honorable estate. It is an indication of inefficiency and nothing more. There is nothing honorable or fine about it. To be poor is quite bad enough. But to be poor without hope … well, the only way to understand it is to be it. I had gone thoroughly through some of the all-fiction magazines and I made up my mind that if people were paid for writing such rot as I read I could write stories just as rotten. Although I had never written a story, I knew absolutely that I could write stories just as entertaining and probably a lot more so than any I chanced to read in those magazines. I knew nothing about the technique of story writing, and now, after eighteen years of writing, I still know nothing about the technique, although with the publication of my new novel, Tarzan and the Lost Empire, there are 31 books on my list. I had never met an editor, or an author or a publisher. l had no idea of how to submit a story or what I could expect in payment. Had I known anything about it at all I would never have thought of submitting half a novel; but that is what I did. Thomas Newell Metcalf, who was then editor of The All-Story magazine, published by Munsey, wrote me that he liked the first half of a story I had sent him, and if the second half was as good he thought he might use it. Had he not given me this encouragement, I would never have finished the story, and my writing career would have been at an end, since l was not writing because of any urge to write, nor for any particular love of writing. l was writing because I had a wife and two babies, a combination which does not work well without money. No amount of money today could possibly give me the thrill that first $400 check gave me. My first story was entitled, "Dejah Thoris, Princess of Mars." Metcalf changed it to "Under the Moons of Mars." It was later published in book form as A Princess of Mars. With the success of my first story, l decided to make writing a career, though I was canny enough not to give up my job. But the job did not pay expenses and we had a recurrence of great poverty, sustained only by the thread of hope that I might make a living writing fiction. I cast about for a better job and landed one as a department manager for a business magazine. While I was working there, I wrote Tarzan of the Apes, evenings and holidays. I wrote it in longhand on the backs of old letterheads and odd pieces of paper. I did not think it was a very good story and I doubted if it would sell. But Bob Davis saw its possibilities for magazine publication and I got a check … this time, l think, for $700. I had been trying to find a publisher who would put some of my stuff into book form, but I met with no encouragement. Every well-known publisher in the United States turned down Tarzan of the Apes, including A.C. McClurg & Co., who finally issued it, my first story in book form. This page was last edited on 23 February 2019, at 22:35.